This means that you can personalise the birthday rosette just the same as you would personalise a badge, with all the same options for designs, colours and text, and of course a photograph. In addition to this you also have the option of choosing a rosette with either single, double or triple layers. All the rosettes are made by us with top quality ribbon in a box pleated format which gives one of the fullest types of fold, which gives a great appearance to the rosette. We have a wide selection of ribbon colours, so the choice is yours as to which colours you use for the layers and the tails. View our other personalised rosettes range by clicking the link. Buy birthday rosettes which are based on our popular range of birthday badges, where the centre of the rosette is based on a 57mm badge. 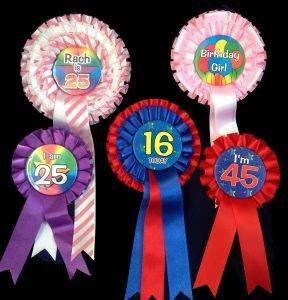 These include our range of age badges where the ages can be any age that you wish. 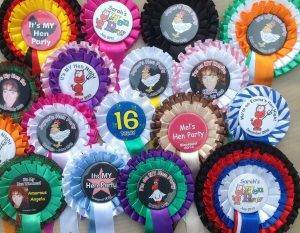 If required you can also add the name of the birthday boy or birthday girl to the birthday rosettes to make it even more personalised. If you want to have a personalised birthday rosette, but you would prefer not to have an age displayed , then we also have a range of birthday rosettes that can be personalised and where the design does not include an age. If you want to use any of the these basic designs to create your own individual design then just email us and tell us how you would like to design your birthday rosettes. Choose from the various types of rosette centres.